Nothing quite compares with spectacular Rio de Janeiro. Blessed with a wonderful natural setting wedged between mountains and the sea, watched from above by Christ the Redeemer atop Corcovado Mountain, and surrounded by tropical forests and lagoons, Rio de Janeiro has transformed into one of the world's most beautiful cities. A city of 8 million people, Rio offers world class hotels, restaurants, shopping, nightlife, beaches and various sporting activities. 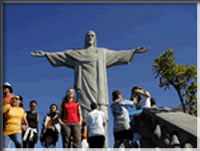 The tour continues to Sao Paulo, the largest city in Latin America, is the heart of Brazil. Sao has excellent restaurants and an abundance of nightclubs and shopping centers.